If your question isn't on the list, post it in comments. Yes. 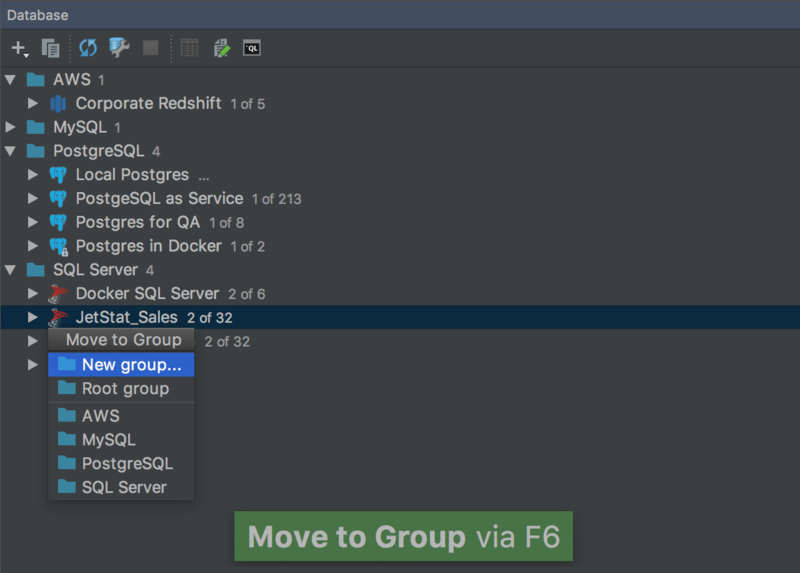 All of DataGrip’s features are also available in other IDEs from JetBrains like IntelliJ IDEA, PhpStorm, PyCharm, RubyMine, as well as the upcoming Rider and Gogland. DataGrip can connect to any database which has a JDBC-driver. It means that you can connect to the database, see tables and other objects, and run queries. Special features of these kind of database are not supported and their syntax is not correctly highlighted. There is an issue in our tracker about adding the possibility to define custom dialects in DataGrip. Our users already have tried DataGrip with: Firebird, SAP Hana, Athena, Teradata, BigQuery. I cannot connect to the database. What should I do? Please, visit our troubleshooting page. Yes, we’re going to add this functionality in future versions. Please, vote here. How can I help make the product better? The best way is to share your feedback. Feel free to report bugs and submit feature requests through the issue tracker. What about data visualization, like graphs or pie-charts? Sorry, there is no data visualization in DataGrip. How do I export data to a format I need? In DataGrip you can create your own format of export. This format should be described as an extractor file. To know how to use custom extractors please see our tutorial: Export data in any way with IntelliJ-based IDEs. How should I connect to MS SQL Server? There is a tutorial covering frequent problems with SQL Server connection. We explicitly support MS SQL Server from 10.50 2008 R2. If you have an earlier version, please go to Options tab in data source settings and choose Introspect using JDBC metadata. MySQL shows NULL instead of '0000-00-00 00:00:00' in datetime field. Why? DataGrip shows time in local time zone, I want it to be shown in UTC, what should I do? Go to Advanced tab of datasource and put -Duser.timezone=UTC into VM options field. Can I mark datasources as Production, Staging, Test etc.? For now, there is the only way to mark your datasources: use colors. How to put data sources into folders? Press F6 on the data source and create a new group. Or add to the existing one. Can I work with existing sql files from my machine? Yes, you need to attach your work directory to the Files tool window. It can be done from the context menu. Please, see the tutorial: Working with files in DataGrip. What about version control systems? DataGrip supports Version Control Systems like Git, SVN, Mercurial and some others. But this support doesn’t come out of the box: you need to install a JetBrains plugin for it. Go to Settings → Plugins → Browse repositories and search for the plugin you need. This plugin will bring first-class support for any VCS you need. DataGrip and GitHub: Step-by-step Integration; How to work with Git in DataGrip. Is there a way to share data sources from DataGrip to other IDEs? Select the data sources you want to share and then go to context menu → Database Tools → Copy Settings. Press + to add a new datasource and choose Import from Clipboard. My Clojure extractors don't work anymore. What should I do? Now there is no Clojure engine by default. To keep Clojure extractors work, please copy this file to lib folder inside the folder where DataGrip is installed. “All the features” are present in PyCharm? The one thing I can’t seem to do is attach a directory to a project. Whereas in DataGrip you have the “files” window, in PyCharm the equivalent is “Project”, with no way to attach external directories that I can tell. Is there a setting somewhere or do you just have to move directories you want to use inside the project directory itself? How do you get the DateTime Picker to use the Timezone of the local machine or even the database server the data source is connected to? I've tried everything I could think of, and it still seems to always be 4 hours ahead of EST. I tried all kinds of variations to the VM options on the data source, but it doesn't change anything. I've checked that my local machine is set to that timezone, and also the db server. @Justin Davis that's a bug, we'll fix it. Thanks!